Uncatalogued. Reproduction of Iron Eyes Cody. Artist John Steele, 1981. Loaned to the Amsterdam Free Library by Thomas Constantino, owner of The Noteworthy Company. 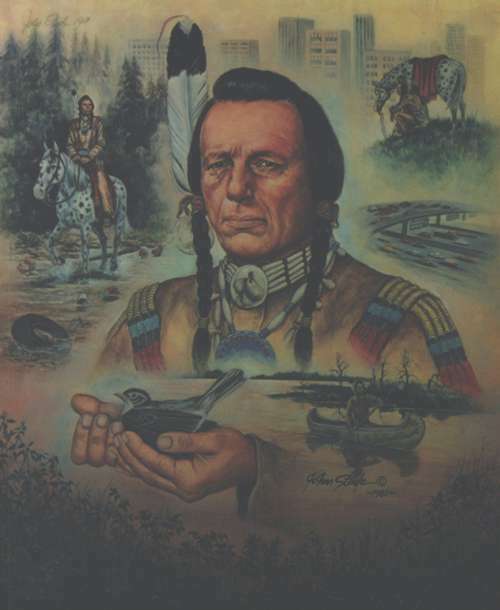 *Grateful acknowledgement is made to The Noteworthy Company for permission to display Iron Eyes Cody by James Steele. Authentic Native American of our time who posed for commercials for The Noteworthy Company and in magazines to help combat pollution of our natural resources. He made many public appearances all over the country in conjunction with the use of letter bags, a promotion directed by Thomas Constantino of Amsterdam, owner of The Noteworthy Company of Amsterdam, NY.